Donald Trump says there has been “a substantial rise in the number of officers killed in the line of duty — a very big rise.” He’s right, to a point. There has been an increase in firearms-related deaths in the last six months compared to a year ago. 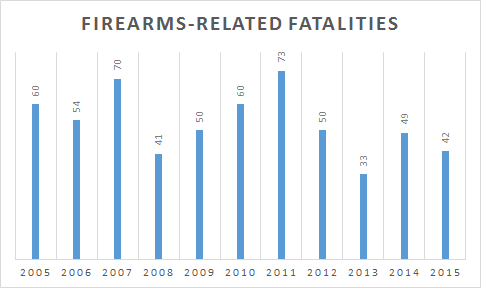 But the number of fatalities from all causes, not just firearms, is largely unchanged from a year ago, and has substantially declined in recent years. Annual fatality data compiled by the National Law Enforcement Officers Memorial Fund show that there have been an average of 135 police fatalities a year under President Obama, from 2009 to 2015, compared with 162 a year for the previous seven years, from 2002 to 2008. That’s a decline of 17 percent. Trump made his remarks at a speech in Virginia. Trump said he planned to focus on military veterans, but he spent the first part of his speech discussing the sniper attack in Dallas that resulted in the deaths of five law enforcement officers. The shooter, Micah Xavier Johnson, a 25-year-old black man, told negotiators that he was angry at the deaths of blacks killed by police officers. Trump, July 11: [W]e’ve also seen increasing threats against our police and a substantial rise in the number of officers killed in the line of duty – a very big rise. The Trump campaign, which now provides speeches with footnotes, cited a USA Today article that reported a 44 percent increase in officers shot and killed so far this year compared with a year ago. The article, which was based on data from the National Law Enforcement Officers Memorial Fund, said there had been 26 officers shot and killed from Jan. 1 to July 9 compared with 18 for that same time period a year ago. That included the five officers killed in Dallas. But the data also show that the number of officers who died in the line of duty from all causes, not just firearms, is about the same as a year ago. There have been 60 as of July 13, one more than during that same time in 2015. Auto crashes, job-related illness and officers struck by vehicles are among the other common causes of law enforcement deaths. As for longer-term trends, the number of law enforcement fatalities has declined substantially in recent years. As we said earlier, there has been a 17 percent decline in law enforcement fatalities in the last seven years during the Obama administration compared with the previous seven years, from 2002 to 2008. In fact, the 109 total law enforcement fatalities in 2013 was the fewest since 1956. 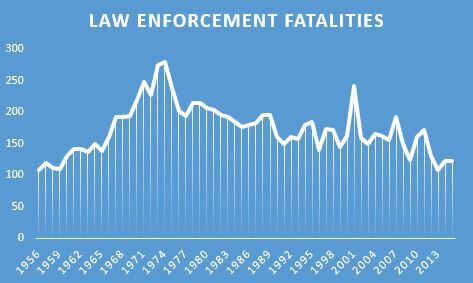 The chart below, based on data from the National Law Enforcement Officers Memorial Fund, shows the total number of police fatalities since 1956. As for the number of law enforcement officers shot and killed, the National Law Enforcement Officers Memorial Fund said such fatal shootings are on the decline. The sniper attack on the police officers in Dallas was the deadliest day for law enforcement since 9/11, and it was a major factor in the “very big rise,” as Trump said, in officers shot and killed. But that’s for six months. The longer-term trends tell a different story.